HIFI Lossless Sound Quality. Support music formats:Mp3/ WMA/ APE/ WAV/ FLAC. One Key Simple Operation: One-key voice recording and one key to lock screen, Easy, Simple and convenient operation. 4000 Songs and more: 16 GB capacity and expandable up to 128GB Micro SD Card. 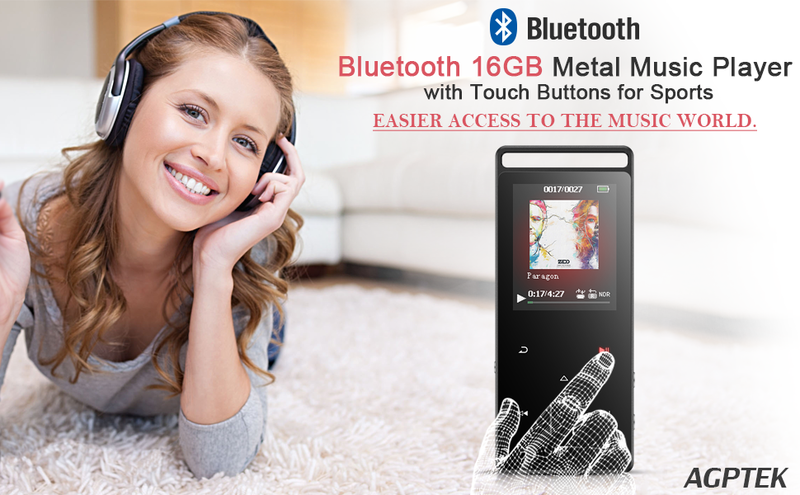 AGPTEK A01ST 16GB Bluetooth mp3 player is a slim and sleek mp3 player with touch button and 1.8inch TFT screen. Hi-Fi sound quality and metal shell provides you excellent user experience. Bluetooth function makes you free from worry about tangle cables. Large Memory and Long Time Playback:The music player has 16GB internal storage and can be expanded to 128GB with a TF card slot built-in. Up to 45h music-playing or 16h video-playing with 1.5 Hours of Full Charge. High Sensitivity Touch Button: Designed with 6 Touch Buttons, Independent Locking and Voice Recording Key. Touch-Screen Designs and A Key Lock Screen, Fashion and Easy Operation. HIFI Lossless Sound Quality: It adopts professional intelligent digital noise reduction chip to reduce noise, ensuring high sound sampling rate and providing Hi-fi class sound that is close to the original. Excellent Sound Quality, Support Audio Formats: Mp3/ WMA/ APE/ WAV/ FLAC. (Not support Audible and DRM directly). Multi-functional: With Music Play, FM Radio, Voice Recording, Resume Playback, E-book Reading (Support TXT Format Only),Video(Support AMV Format Only). Built-in Pedometer Function, Perfect for Sport,fitness, Running,Traveling ect.